South Korean manufacturers LG following in the footsteps of other OEM’s such as Sony and Panasonic have also stepped into the limelight of dust proof and waterproof smartphones with the launch of the new LG Optimus GJ. 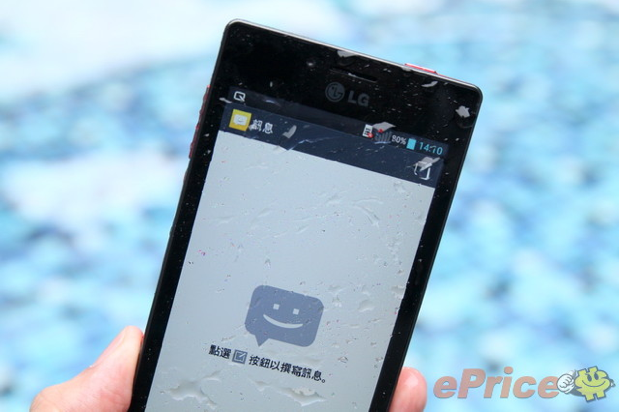 The new device which is currently only scheduled to be launched in Taiwan, features similar specs to its predecessor, the Optimus G but with the addition of the new water/dust proof HD display. The Optimus GJ is stated to traverse upto 30 minutes in 1 meter of water having a IPX7 rating which means that you would be easily able to take your phone with you inside a swimming pool or even using it outdoors when its pouring cats and dogs. The most impressive factor that we found about the new flagship phone is the removable plastic battery cover unlike the Optimus G which was completely enclosed in Gorilla Glass 2. As mentioned earlier, the device would only be available in Taiwan and is expected to be sold for around $600 with no further word by LG as to exactly when it would be made available in other countries. We’ll keep you guys posted on any further updates.